My husband, Jim, and I have always been restless wanderers. While I used to work in the travel industry and we traveled frequently, it was never enough. Never long enough. Never deep enough. So, in 2007 we sold our house, packed up our belongings, and embarked on a 14-month, 20-country, and five-continent backpacking jaunt around the world. Rather than satisfy our curiosity, this trip only fed the fire burning in our souls for more. These decisions are what have landed us here. For the last 496 days, we have been nomadic. The initial goal was simply to drive the Pan-American Highway from Oregon to Patagonia, exploring Latin America in the process. Funny how the twists and turns of life waylay your plans. Rather than finding ourselves in Panama by now, we find ourselves back in Mexico. We made it as far as Lake Atitlan in Guatemala, where the magic of that amazing place held us captive for 87 days of our 90-day visa. A near-perfect climate (around 64 F), some of the most extraordinary scenery we have ever enjoyed, and an intangibly attractive vibe held us there. San Marcos la Laguna was our home base at Lake Atitlan. Monthly rentals average around $500 to $700, although you can find basic accommodations for much less. Food is less expensive in the larger villages of San Pedro or Panajachel, but produce is very inexpensive in general. A full week’s worth could easily be had for $20. Avocados, limes, bananas, and oranges literally fall from the trees. Most items can be found, although “Western” desires such as canned pasta sauce or brand name peanut butter can be twice the price of the U.S. If our visa wasn’t expiring we might have simply stayed forever, and many people we met had done just that. With volcanoes surrounding the stunning lake, and the steep landsides dotted with villages filled with culture and color, the road may someday lead us back for good. And yet Mexico has drawn us, once again, to her shores. Our most oft-visited country in a life lived traveling, we thought we might be done with her for a while, and yet, here we are. As we left Guatemala, the choices seemed endless. We knew we wanted to spend Christmas in stunning San Cristobal de las Casas and New Years in beautiful San Miguel de Allende. And yet one of our favorite cities was calling our name, a city that drew us in with its Spanish culture, history, and scenic beauty—the town of Patzcuaro. We had spent time there heading south, happily set up in a comfortable campground within walking distance of both the city center and the lake. Once again, the rich café culture, many centuries of history, and rough cobblestoned streets continue to enchant us. In the end, it turned out our compass pointed even further north, to our favorite beach town in Baja, Los Barriles. In four different visits—spanning nearly three months—we had come to love the comfortable, small-town feel. The beach is wide and white, the water turquoise. Our campground featured a beach-side pool and happy hour bar complete with rocking chairs. We spent most of our time shopping at the local tiendas (stores) and markets, but readily admit to loving the opportunity to pop into the local gourmet grocery store, to enjoy movies in the park once a week, and take in the Saturday market. Patzcuaro and Los Barriles are both typical Mexican towns where you can camp for $10 a night or find vacation rentals for $100 a night. Food runs the gamut, with $1 taco stands on nearly every street corner, going up to first-class restaurants that will set you back $40 per person. Coffee shops are inexpensive everywhere with Patzcuaro, set high in the hills of Central Mexico, winning for taste and quality. Our feet are still restless, our souls still in search of a potential new place on the planet to call home. 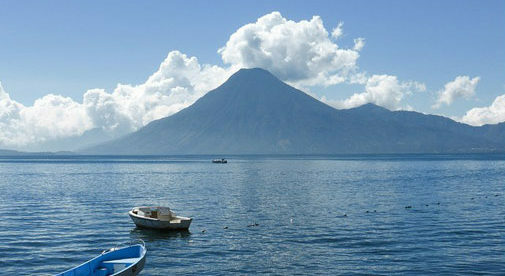 Lake Atitlan may be too remote. Patzcuaro is too far from the beach. Los Barriles has too much desert. Where we will land remains to be seen, but we know we are rich with options.